Posted on November 28, 2018 at 2:34 pm. 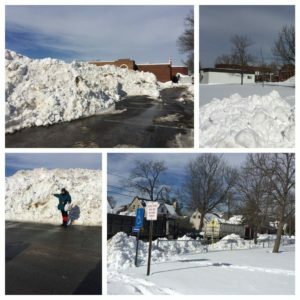 The first snowfall of 2018 is behind us, and as we move into the winter months when “snow days” are more likely, we want to take this opportunity to share some general information about our inclement weather procedures and ask families to review them prior to another weather-related school closing, delay or early dismissal. All of us at APS understand that any change in the school schedule is disruptive for everyone involved, and the safety of our students, staff and families is our top priority. How do you decide? Who makes these decisions? APS staff consults the National Weather Service and confers with regional representatives from the Virginia Department of Highways, the Arlington County Department of Public Works, mass transit, local and regional public safety officials and other federal and local agencies, as well as neighboring school systems. In addition, APS transportation and operations staff members check roads in neighborhoods and around schools to obtain firsthand information on current conditions of the roads, bus stops and parking lots. Once this information is gathered, staff briefs the Superintendent who makes the final decision in consultation with the APS Executive Leadership Team. When are the decisions announced? Why aren’t announcements made sooner? Many of us joke about local weather forecasters “getting it wrong,” but the reality is that weather conditions can change quickly. For that reason, we often wait until the next morning to make sure that what was predicted is accurate. This allows us every opportunity to keep schools open (if possible) and operate under a normal schedule. What if the snow hasn’t started by the time you decide? NEW THIS YEAR: If the forecast on the day before a snow event indicates that snow will not start until the beginning of the school day, we will now announce a 2-hour delay by 6 p.m. the evening before. This will help families plan for a possible change the next day, while also giving APS more time to monitor regional preparations and to see how the forecast evolves over the next 12 hours. When this occurs, we will assess weather forecasts and road conditions the next morning, and will send a final APS School Talk update by 6 a.m. to let everyone know if APS plans to continue with a delayed opening or if conditions require us to close for the day. How are closures and delays communicated? Visit the website at www.apsva.us. Check your email for an update from APS School Talk. Tune in for news updates on major English or Spanish television & radio stations. For those who live in Arlington, watch for an announcement on AETV on Verizon Channel 41 or Comcast Channel 70. Call the APS Hotline at 703-228-4277 to hear a recorded message. Ten month employees are NOT expected to work when schools are designated as closed. Twelve-month employees, however, ARE expected to report for their regular work schedule, unless unscheduled leave is available or an announcement is made that offices are closed. In extreme conditions when schools and offices are closed, essential employees may be asked to report. If you are unsure, check with your supervisor to find out if your position is considered “essential” during inclement weather conditions. During a two-hour delay, essential employees and food service workers should report to work at their regularly scheduled time. All other employees should report to work two hours past their usual start time. The Extended Day program will also open two hours late and morning field trips are canceled. If you have specific questions about your position, speak to your supervisor. For more information on snow-related closings, delays, and emergency updates, visit www.apsva.us/emergency.